This week’s photo comes from Orange, well near Orange NSW Australia. Its at Lake Canobolas just outside Orange, our local swimming hole as youngsters and the place to go to make out after dark….. This time though I actually went in the daylight, reminiscing about times past and trying to capture its beauty in the autumn. 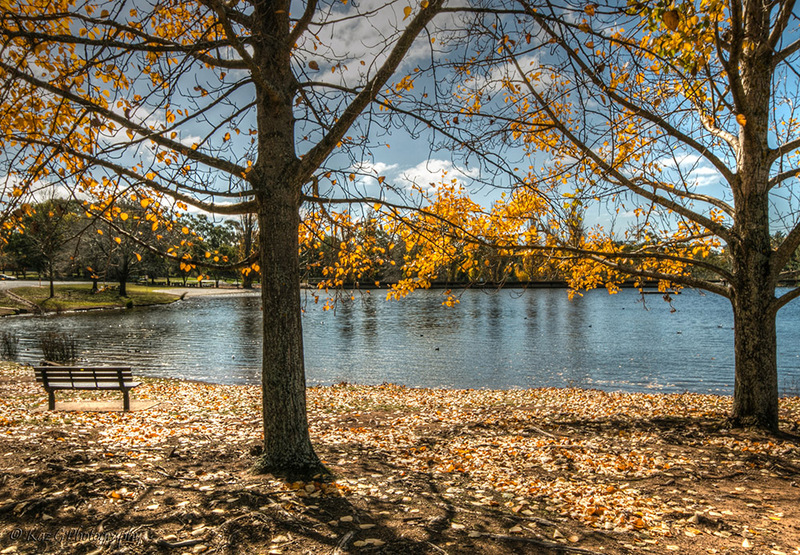 I found two lovely trees bristling with yellow leaves with a nice bench close by overlooking the majestic lake. Funny how times change. This visit I looked at nothing but the beauty of the place and how I could capture it with my camera. Years ago that was the furthest thing from my mind when venturing there after dark. Funny these days I would be nervous to be out in a secluded area in the middle of the night with no such thing as a mobile phone. How times change! Beautiful photo of what looks like a beautiful place. The whole place looks very inviting, no wonder you loved going there when you were younger. Inviting on a hot day. Unfortunately in autumn icy winds didn’t make the water look so inviting. j Guess we took it for granted. It’s not until you move around that you realise what you had. Lovely and bright, very inviting. How times do change our perceptions, what we used to do we now wonder about! Thanks Amy. It was nice to see Autumn as we don’t get it where I normally live. it’s like looking through a window with the frame border. So peaceful and lovely Kaz!